Let your loved ones cherish the moment that this Basket Hamper of Fresh Fruits and Rose Bouquet that creates with the essence of your love for them. 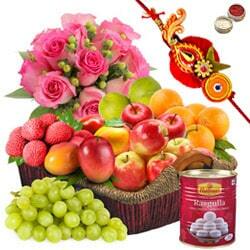 This delivery Cradle contains 2 Kg Fresh Fruits (1 Kg Apple and 1 Kg Any Seasonal Fruit) and 10 Pink Roses Bouquet with 1 Regular Rakhi and Roli Tilak Chawal. Let your loved ones cherish the moment that this Basket Hamper of Fresh Fruits, Haldiram Rasgulla and Rose Bouquet that creates with the essence of your love for them. This delivery Cradle contains 2 Kg Fresh Fruits (1 Kg Apple and 1 Kg Any Seasonal Fruit), 1 Kg Haldirams Rasgulla Tin and 10 Pink Roses Bouquet with 1 Regular Rakhi and Roli Tilak Chawal. Let your loved ones cherish the moment that this Basket Hamper of Fresh Fruits, Haldiram Rasgulla and Rose Bouquet that creates with the essence of your love for them. This delivery Cradle contains 2 Kg Fresh Fruits (1 Kg Apple and 1 Kg Any Seasonal Fruit), 1 Kg Haldirams Rasgulla Tin and 10 Pink Roses Bouquet with 2 Regular Rakhi and Roli Tilak Chawal. Let your loved ones cherish the moment that this Basket Hamper of Fresh Fruits, Haldiram Rasgulla and Rose Bouquet that creates with the essence of your love for them. This delivery Cradle contains 2 Kg Fresh Fruits (1 Kg Apple and 1 Kg Any Seasonal Fruit), 1 Kg Haldirams Rasgulla Tin and 10 Pink Roses Bouquet with 1 Bhaiya Bhabhi Rakhi and Roli Tilak Chawal. Let your loved ones cherish the moment that this Basket Hamper of Fresh Fruits, Haldiram Rasgulla and Rose Bouquet that creates with the essence of your love for them. This delivery Cradle contains 2 Kg Fresh Fruits (1 Kg Apple and 1 Kg Any Seasonal Fruit), 1 Kg Haldirams Rasgulla Tin and 10 Pink Roses Bouquet with 1 Family Set Rakhi and Roli Tilak Chawal.